We do all kinds of brickwork, including tuck pointing, parging, poured concrete crowns, rebuilding walls and chimneys. 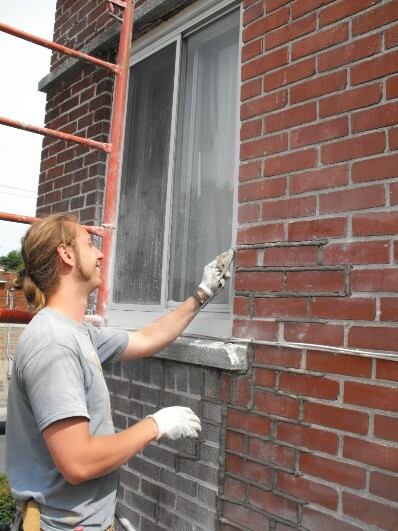 We take time and care to match the mortar color and also to get the best brick match. Restoration is our specialty. If your brickwork needs tuckpointing we are the ones to call! 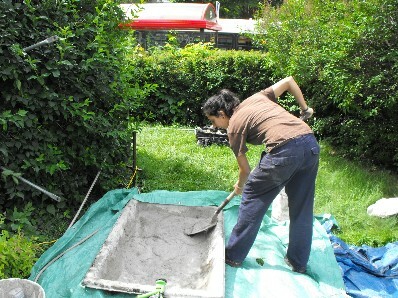 We grind away the damaged mortar joints with a diamond blade about 1" deep. We then refill the joints with proper colored mortar which includes a concrete weld bonding agent to ensure durability. We finish the joints in the same style as the original brickwork or as per your request. If you need your chimney or wall rebuilt we have the expertise you need. We remove bowls and rebuild chimneys using the best brick match we can find, or we can recycle your bricks! We use brick ties to hold the brickwork in place so that the problem will not reoccur. We take the utmost care to protect your roof, and garden areas. The first line of defence against water damage is a chimney's crown. We make a custom wooden form and pour the crown in place. Our crowns are built with a drip edge, to shed water away from the brickwork. This keeps your chimney in good shape for many years to come. Beautify your foundation! We remove all loose parging and apply parging with a concrete weld to ensure longevity. A new layer of parging gives your foundation a protective coat and makes it look really nice too.